Search for the best flight prices from Manchester to Hurghada. Compare prices, book today and save money with Manchester Airport. Hurghada’s story is relatively recent, having been developed since the 1980s from a relatively obscure fishing village into a safe haven for water sports enthusiasts, with year-round sun and around 36km of beachfront. Whether you're looking for a complete get-away-from-it-all or a resort brimming with family-friendly fun, Egypt's longest established Red Sea holiday town offers an array of choices. For far-from-the-crowd seclusion, head south from Sigala. 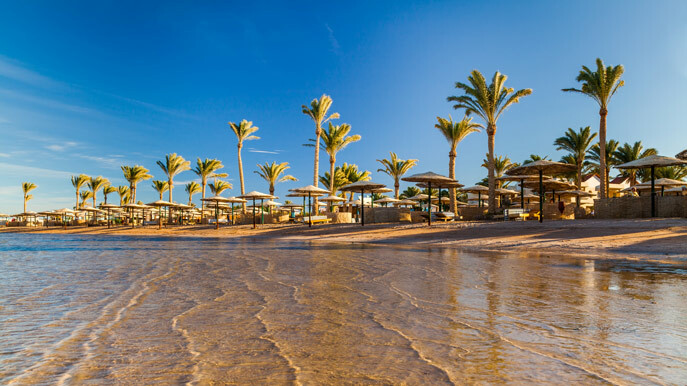 Oberoi Sahl Hasheesh (Sahl Hasheesh Road) comes up trumps, while Kempinski Soma Bay (Hurgahda-Safaga Road) is a peaceful idyll soaked with lashings of glamour. Mid-range resorts Dana Beach (Sahl Hasheeh Road) and Iberotel Aquamarine (South Magawish Road) cater well for both families and couples, with oodles of activities on offer. For budget hotels in Hurghada, Ad-Dahar and Sigala are the areas to look. The clean, comfortable rooms at White Albatros Hotel (Sheraton Road) are slap in the centre of town. The Old Town quarter of Ad-Dahar offers lots of opportunities for local shopping in Hurghada. Follow the scent of cinnamon and cumin to the local souk between Sheikh Sabak Road and Al-Horreyya Road, and put on your haggling hat. This jumble of alleyways is a magpie's delight of copperware, ceramics and spice. Half the fun is sitting down with the vendors to drink syrupy tea while bargaining hard for your treasure. For fixed-price shops, head to Sigala. New Marina Road is where to come to browse the latest brand-name bikinis and beachwear as well as look for high-quality papyrus, wooden inlay work and perfume. An array of international cuisines, succulent seafood, and laid-back European-style cafés mark Hurghada out as a long-time player on the tourism scene. In Sigala, Shade Bar and Grill (New Marina Road) is king of the steaks, while La Casa del Mar (Sheraton Road) provides a touch of Scandinavian-inspired dining in Egypt. Ad-Dahar is the place to head to sample Egyptian flavours, with the cheap and tasty seafood at Red Sea I (An-Nasr Road) a local favourite. Hurghada's top drinking spot is Papas Bar (New Marina Road) with its friendly vibe and well-stocked bar. The Red Sea's premier sporting festival attracts local and international competitors alike. The big event is the off-road 75km run from the sea to the desert escarpment. It's the perfect excuse to get off the beach and put your trainers on. Keen anglers from all over the world descend on Hurghada during February to try and snare the big one in a variety of fishing competitions. The Egyptian holiday of Sham al-Nissem marks the beginning of spring. Join in the picnicking fun on Hurghada's public beaches at this time, as local families take over the shore for the weekend. The holy month of Ramadan is Islam's biggest religious festival. During the day when Muslims are fasting, Hurghada is quieter than normal. After dusk though, people take to the streets to socialise long into the night. Many Hurghada restaurants put on events during the evenings of this month. This festival celebrates Hurghada's international standing as a prime watersports destination with demonstrations and a series of competitions.